I want to tell you a story, an old story that has been passed along over the years, and is perhaps best known for appearing in a book written by M. Scott Peck, though he did not originate it. It is the story of a monastery, a religious community, which had fallen on hard times. First there was persecution and later it was simply out of fashion to go to church or to choose a religious life. What once was a thriving community with many different locations became one solitary monastery, a large and beautiful place served by only five monks, all elderly. They wondered how the monastery could go on, and between work and worry they felt completely discouraged with life and God and most of all with each other. Now it happened that in a nearby town lived a rabbi, a wise man who led his own community of faith, and the rabbi had a habit of taking times of quiet reflection in a little hermitage in the woods near the monastery. Sometimes the abbot would visit with him, and at this time of great tension and concern, the abbot hoped the rabbi might have some wisdom for him. They visited together and commiserated over the changing times. No one seemed to be as committed to a life of faith as they had been in the good old days, they both agreed. When it was time to go, the abbot said to the rabbi, "I hoped you would have some advice for me, but it seems we have the same kinds of problems". And the rabbi said, "I’m sorry, I have no advice. All I can tell you is this: one of you is the Messiah." Each of the monks began to regard the other brothers differently, looking at one and then another, wondering, could it be he? And because this possibility had been raised, the crankiness that had become part of their worried lives together gave way to a sweetness of face and voice, for if we look into another person’s eyes, wondering if that person might be the Messiah, it makes us look at that person differently, makes us choose our words and our tone *very* differently. Now the one thing that brought people to the monastery was its beautiful grounds. People came to picnic or to walk and enjoy the beauty of God’s creation, and for a long time they had probably done this despite the fact the monks were unhappy and unpleasant. But as the monks changed their way of treating each other, the atmosphere of the monastery changed completely. Visitors could feel the extraordinary respect shared among the monks, and they wanted to come back again and bring their friends. Eventually some young men came who wanted to join the order, allowing the life of the monastery to continue beyond the lifetimes of the five old men who had been so downhearted only a short time before. And so the people and the place changed; they grew into a new form, from the small seed of mystery and respect planted by the rabbi. Did you know that a mustard seed does not grow into a spreading tree? It grows into a rather dry-looking shrub, a shrub that spreads by spilling seeds that make more shrubs. But Jesus imagines the kingdom of heaven as a mustard seed that grows into a spreading tree, a tree in which the birds come and make their nests. For that to happen, it would take a miracle. So the kingdom of God is the place where miracles happen, where unexpected growth occurs. From that tiny seed grows the kingdom of heaven, a place where even the birds have a home in spreading branches. I’d like to tell you about small beads that brought hope. Shortly after I began serving my first pastorate at Small Church, I sent an e-mail to my friend, Anne, a mom and social worker from Falmouth who ended up in South Africa as a missionary with her husband, Scott, a UCC pastor. They went with their three little girls, ages six and under, and they promised to serve four years, Scott working with the United Church in South Africa and Anne with an agency helping families and children. I asked Anne what they were doing and whether there was anything my small church could do to help? Her reply came with a plea for help. Through the agency, Anne had become one of a team working with a group of HIV positive women invited to a support group, its purpose to help them cope with their diagnosis and the fact that many of their young children had received the virus in childbirth or while being breastfed. The women arrived depressed and dejected. Although a crèche, what they call a daycare nursery, was provided for their children, they did not want to be separated, feeling the doom of disease hanging over their heads. Then someone suggested teaching the women a traditional craft, to see if they could earn a little money. A skilled woman came to teach them how to make beaded jewelry, with teeny, tiny little beads. They made bracelet and necklaces and Christmas ornaments, and they made badges decorated with the red ribbon symbolizing support for people with HIV and AIDS. Anne and the ladies of the beadwork cooperative needed our help to open a bank account in this country so that churches here would have a place to send money after buying the jewelry. Anne explained that the money went directly to the ladies; they divided the profits and were learning how to run the business themselves, with the aim that Anne and the others from the agency would be “put out of work.” She explained that forming the business had already begun to change the women’s lives. They came each day with their hair neatly done, wearing clothes they had taken more trouble to arrange. Although none of them will ever grow rich on the beadwork or the sewing they added to their catalog, the income they receive enables them to buy healthier food for their families, the fruits and vegetables they need to keep their immune systems as strong as possible. And here was the ultimate sign of life: the mothers began to send their children to the crèche, confident that life would go on for another day and week and month and year. At Small Church, we heard these stories and we sold the badges and we prayed and prayed and prayed for the women. Finally someone asked if we could ship a box of prayer shawls to the dozen beadworkers who had come to mean so much to us. All our knitters set to the task, and soon we sent them off with special blessings. When Anne returned we had the joy of hearing that not only had the women come to Anne’s church for a second blessing, they had sung and danced in the church, too, to show their thanks. And when they took their Christmas outing to the beach, the shawls went with them. 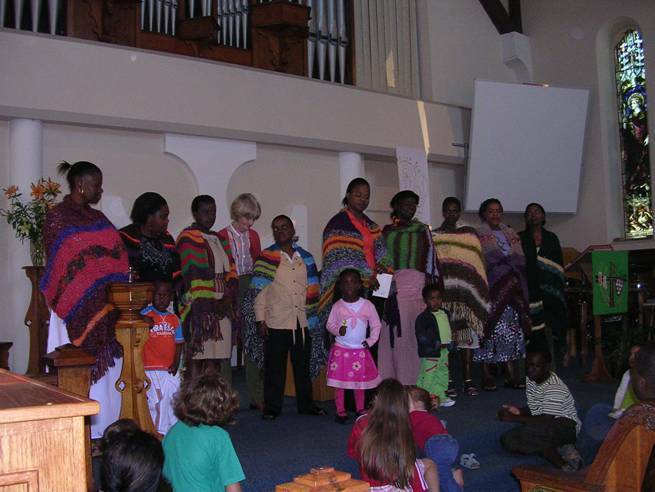 Those shawls came from people in a church convinced it was too small to make a difference, but the people of Small Church no longer believe that is true. Just like their new friends in South Africa, they came to know they could do more than they had ever imagined. On the day I sent that email to Anne, I didn’t know what kind of seed I was planting, what sort of beads and seeds would grow together, small as they were, into love spreading across an ocean. One of the tasks of the interim time is to determine the future mission of the church, to seek the way forward while trying to determine God’s purpose for the community. I think about attending a meeting at the Community Center a few months ago and seeing many church members there, representing different groups in this town. What will be the mission of this people of God? How can your work of faith reach out from this challenging location? There are three kinds of respect that are crucial for a community of faith, three kinds of respect that I believe make it possible, no matter the material circumstances, for a mustard seed to grow into a spreading tree. • First, there is self-respect. As the women of Sisonke show us, as they learned themselves, when you take care of yourself, things that seemed impossible turn out to be quite possible after all. • Finally, and most importantly, there is a respect for God, a seeking of God’s working among us, in our individual lives and as a faith community. If we live and work and worship and pray together with an attitude of deep, mutual respect, I believe all things will be possible, with God's help. So do not be discouraged by present circumstances or spend your time worrying about bringing back the past. We must set our minds and hearts on the future, listening for God’s vision for this church, looking for the ways we can show respect, extraordinary respect, to God, to each other and to all of God’s children. To grow the kingdom of heaven, we start by planting the smallest seed. Amen. Mission seeking, good thing to include in mine tomorrow, thanks for the idea. Amen! I know more than one church that could stand to hear this sermon. Thanks! Tears and a smile Songbird, this was beautiful. Prayers for your congregation’s courage to respond. wonderful sermon – may be sharing your first illustration, too good not to use. I’m with my brother-preacher this morning and we’re tag-teaming the sermon, one we wrote together LATE last night. Will be praying for you, and the ministry I know will flow through you this morning. Amen, yes. Thank you so much. Wow Songbird! This sermon, is not only a sign of your faithfulness to God’s calling but I’m sure a gift to the church and community you serve. It was also a great way for me to start my week (with a good, inspiring, well-prepared sermon) unlike the one that came from my mouth yesterday! LOL!